The logic of this template is simple. it keeps the harmonic relationships above and the subharmonics below. It also keeps the 7 limit and less limits within a 90 degree angle. The angles of the 7,11 and 13 are chosen to prevent notes or lines landing on top of each other. The lattice to the left is the main one used by Wilson throughout the archive. The modified lattice on the right is included here as an option for those who run into problems with the first. 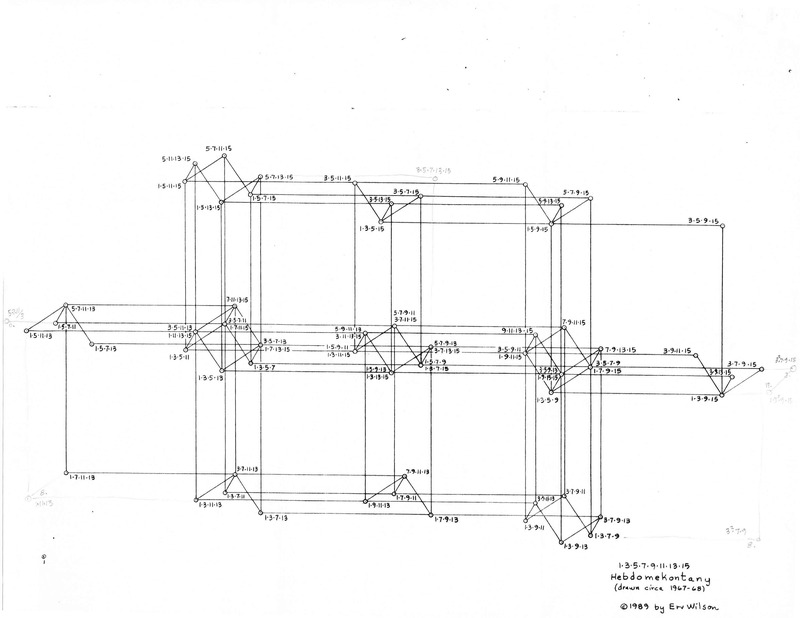 This chart of the Hebdomekontany below shows the level of complexity these lattices can handle and serves as a good test for any lattices readability. 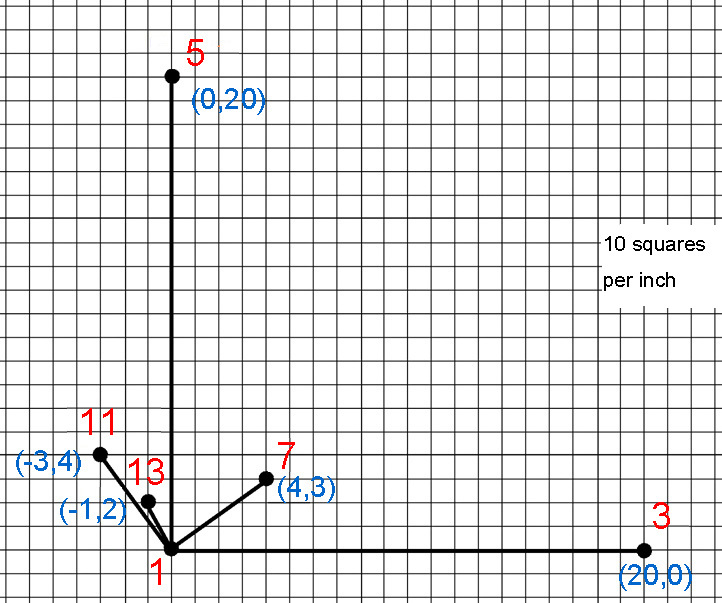 Below here are two measuring possibilities for illustrating a scale in terms of interval size horizonally. The top for those working in inches ( 1inch = 120 cents) and the bottom is for those using metric (1centimeter= 50 cents). 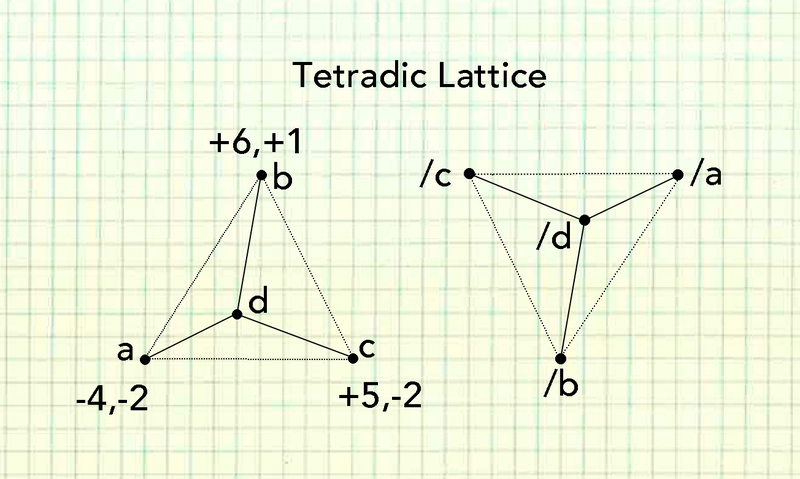 This is a tetradic lattice Wilson would use especially when working with hexanies or 7 limit tunings. It works well to avoid tones landing on top of each other. The factors a ,b ,c, and d can be used to represent any harmonic (or melodic) interval which can be useful when looking at hexanies. It is worth noting that the generalized keyboard can be recognized as a lattice with the advantage of both harmonic and melodic structures easily seen. The disadvantage being that the harmonic templates between different keyboards is not guaranteed to be consistent. Some of Wilson's earliest investigation into tuning were collected within a series of notebooks. Often he would label these in terms of a special interest such as 31 tone, CPS, or 3^8 Euler Genus as examples. In practice often these labels would last apply to the first few pages and like subjects reappeared in different notebooks and in different periods. For the moment, the idea is to consolidate like material together and place in files of their own. This ongoing work has produced these files below with many more on the way. Wilson had a great interest in 22 tone constant structures that encompassed his 20 note Eikosany structures. While none of the simpler ratio Eikosanies result in constant structures, 22 tones offered the potential of bringing melodic consistancy to these structures high in harmonic condenseness with the addtions of only two tones. Wilson used these following hexany based sets in search of not only Eikosanies but any harmonicly condensed structure possible with 22 tones. Regardless their use far exceeds this purpose being useful in evaluating other temperaments and their potential limitation in articulating cetain types of relationships in a meaningful way. Thus what on paper might appear to be a small error, these structures can often bring to light quite quickly the user might run into ambiguous situations while at the same time accenting a tuning stronger points.